It is at this time of year that I begin to get really excited about plans for the summer. Our main programme is decided and we are delighted to share with you the highlights of what promises to be a very special two weeks. Our opera this year will be Britten’s Death in Venice which was last heard at the Festival ten years ago. I will be performing Gustav von Aschenbach in this opera (Britten's last) in a new production at the Royal Opera House, Covent Garden in the autumn and the St Endellion performances will be a wonderful opportunity for me to explore this extraordinary work. Based on Thomas Mann’s novella which was also the inspiration for Visconti’s famous film, starring Dirk Bogarde, Death in Venice is Britten’s most mature and deeply-felt opera, Roderick Williams will join me in the multiple baritone rôles and Robin Blaze will be the Voice of Apollo. We are incredibly lucky that Ryan Wigglesworth will conduct once again and I really hope that you will be as enthusiastic as I am about this magnificent piece. Performances will be on Wednesday 7th and Friday 9th August. The opening concert, on Wednesday 31st July, will showcase Ryan’s talents as a pianist when he plays and directs Beethoven’s 1st Piano Concerto. The second half of this concert will be dedicated to Part One of Mendelssohn’s St Paul. I performed this piece recently in Munich and fell in love with its drama and brilliant orchestral and choral writing. Mendelssohn’s St Paul may not be as well-known as his Elijah but it is every bit as good. We are thrilled that Adam Hickox will return to the Festival and conduct a work that his father championed and recorded. 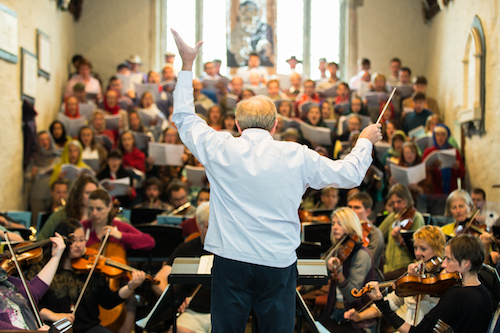 This year we are experimenting with an early-evening concert with a performance of Elgar’s The Apostles at 5pm on Saturday 3rd August. We hope that this will please friends who don’t enjoy driving later at night and allow others to have a post-concert supper in one of the excellent local restaurants. The thematic relationship to Mendelssohn’s St Paul is very pleasing - both pieces being based on the Acts of the Apostles - and also highlights that sometimes a composer’s best music is in a lesser-known work. The cast will be led by Sophie Bevan and Neal Davies and Ryan Wigglesworth, who showed us last year what a great Elgarian he is, will conduct. There is a second opportunity to hear The Apostles in the wonderful acoustic of Truro Cathedral at 7.30pm on Monday 5th August. The final orchestral concert on 8th August will include a favourite of the repertoire, Sibelius’s 2nd Symphony conducted by Ryan Wigglesworth and Gabby Painter will direct a work for string orchestra piece in the first half. There will be chamber music concerts on Thursday 1st and Sunday 4th August when we will display some of the extraordinary talent in our ranks. I would urge you to try the chamber concerts - they very often prove to be highlights of the Festival. Our late-night concerts will include a chance to hear our brilliant percussionists using the extraordinary range of instruments called for in Death in Venice - a virtuosic and highly-entertaining performance guaranteed on Thursday 8th August at 10pm, and Roderick Williams and I will bring our acclaimed Songs of the Sea programme to St Endellion with Iain Burnside and Victoria Newlyn on Sunday 4th August at 10pm.